It is without a doubt that there have been many strange and shocking discoveries found in many different places around the world. Not too long ago an ancient city was found underneath the rec yard at a prison. More recently though builders on a construction site in Malaysia made a shocking discovery that very well may make it into the Guinness World Book of Records. 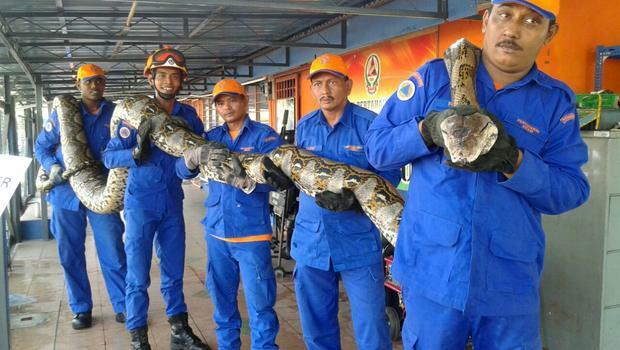 Construction workers in Malaysia discovered a python on their building site. This python was kept in a room and given food and water until the appropriate authorities came. This 550 pound, 25 foot long python died three days later though after laying an egg. The current largest known python is living in captivity in Missouri at this time. I can remember doing construction and finding random items such as pipes or pictures but I’m not quite sure what I would have done if I would have discovered this epicly large snake. There are many pictures that are circulating the internet today that claim that 200 foot 10 thousand pound snakes have been found. While this is untrue it is rather shocking to know that there are snakes out there in the oddest of places that weigh in double that of most grown men. If this is not evidence that alien life lives amongst us, I’m not sure what is.